British Rowing has appointed four indoor rowing Master Trainers to deliver training for fitness professionals as part of Go Row Indoor, British Rowing’s mass participation indoor rowing programme. The new appointees are Kate Ingles, Level 3 PT and CYQ Fitness Instructor of the Year 2014; Matt Gleed, PT, TRX Master Trainer and Power Plate Master Trainer; John Healey, PT, S&C coach and Concept2 qualified instructor; Denise Page, a fitness professional with 25 years in the industry. The new Master Trainers took part in two days of training at British Rowing HQ. 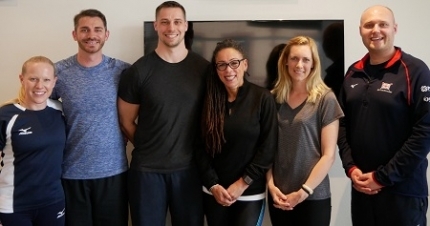 The four new Master Trainers will be joining the four who were previously appointed in 2017, helping to meet the demand for Go Row Indoor training for fitness professionals across the country. The Master Trainers will assist in delivering British Rowing’s instructor training programme which has been accredited by CIMSPA and REPs and requires participants to be a minimum Level 2 fitness instructor. Along with learning the fundamentals of instructing correct rowing technique, instructors will learn about a range of training plans for members and clients and how to deliver three indoor rowing class formats. These include two gym floor classes lasting 20 and 30 minutes, along with a 45-minute studio session combining circuit exercises and indoor rowing. The classes have been designed by British Rowing to offer a full-body cardiovascular workout for gym members.